For more than 20 years, our cruise and escorted tour specialists at Key Traveler has provided thousands of travelers like you with expert knowledge, first-hand experiences, and great rates. It all began twenty-five years ago, when Marcy and Jeff Silverman decided to take a short cruise to the Caribbean because it sounded like a good idea to enjoy some fun and sun without the hassle of packing and unpacking, island hopping, and figuring out where to eat. The onboard entertainment was a bonus and the food was fabulous. After their great travel experience, Marcy, with her sales background, and Jeff, an experienced marketing and retail executive, decided that they wanted to help people have great travel experiences just like the one they had. So they opened their own cruise agency, Key Cruises. Key Cruises joined forces with an established national agency, offering clients better deals than direct-to-cruise line and escorted tour bookings. Within a year a half, Key Cruises grew to become that agency’s first outside agents to achieve $1 million in sales. Business kept evolving, and Key Traveler kept evolving with it. With travelers’ appetites for more destinations growing year by year, many clients began booking more and more luxury cruises, adventure cruises, river cruises, and escorted land vacations, expanding their travel to all continents of the world. 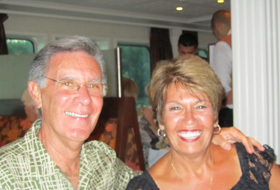 As a result, Key Cruises grew into Key Cruises &amp; Tours and, more recently, to Key Traveler. We also packed our bags and relocated to new, larger headquarters in South Florida in 2016. Now, we better reflect the nature of clientele: travelers with “bucket lists” to fill. But, don’t worry, we never forget our roots: our personal relationships with clients, consistent low prices, and no call center. We are not just travel agents. We are travel advisors. Welcome to the Key Traveler family.